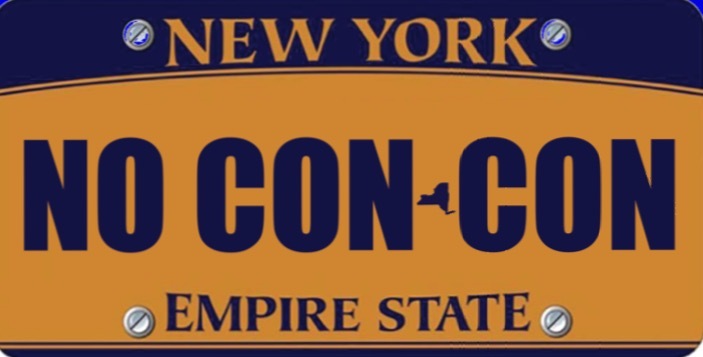 A New York Constitutional Convention (ConCon) will cost taxpayers millions of dollars and history shows that the people will not actually control the ConCon and outcomes, politicians and lobbyists will. Past conventions have been riddled with rigged agendas and political patronage. Despite the assertions to the contrary, a ConCon is NOT the only way to amend the constitution. The public referendum process has successfully amended the constitution more than 200 times. In fact, the constitution has been amended seven times in the last few years using this process, which included the voters approving casino gambling. Given that more than 70% of New Yorkers aren’t even aware of the vote, there does not appear to be a pressing public concern justifying it. It is a waste of time and money to conduct a Constitutional Convention and there is only risk of politicians eviscerating rights and protections that working families in New York count on. On November 7 flip your ballot over and Vote NO on the ConCon!